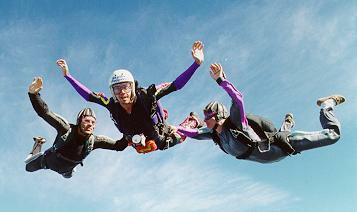 There are three basic ways to start out skydiving. 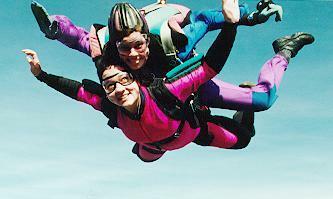 The simplest is to go for a tandem jump. For someone who wants to go skydiving once, or isn’t sure if they want to do it more than once, tandem is probably the best way to go. The tandem jump has the shortest ground school, and the most “free” time where you can just look around and enjoy the freefall. A tandem jump is where you attend a short (15-45 minute) ground school, then jump out of a plane with an instructor strapped to your back. The instructor will intercede if you do anything wrong, and is right there to guide you. You both ride under a single large parachute. Although this is a great introduction to the sport, it does not provide you with the ability to jump alone. In order to do solo jumps, you first need to train in an Accelerated Freefall (AFF) or Static-Line course. The AFF course is designed to teach you what you need to know, quickly and safely. The Static-Line course is far less popular because it takes longer and sometimes ends up being more expensive (although at some drop zones it is actually less expensive). Before AFF came into existence, the Static-Line course was your only way of learning. To find out more about AFF or tandem skydives, check out the stories written by people who have been through the AFF training or have done tandem skydives. For more photos, check out my skydiving photographs section. To find a place to skydive near where you live, visit the USPA Drop Zone List.